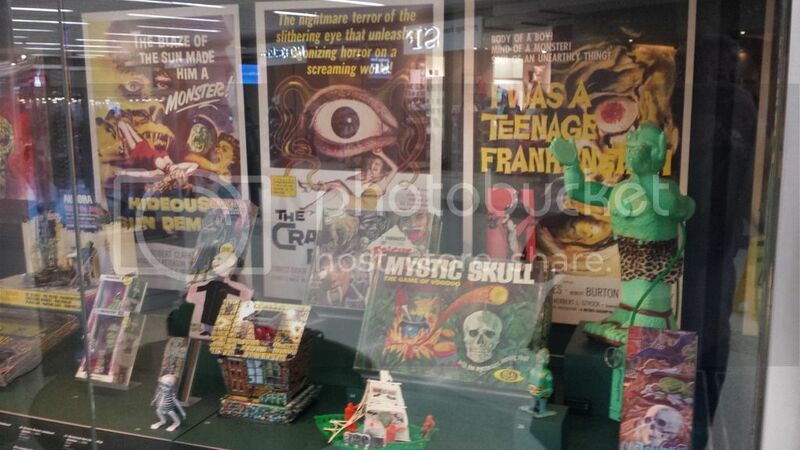 Quote: “The movie-posters collectors network is totally dysfunctional and insane,” Hammett says. 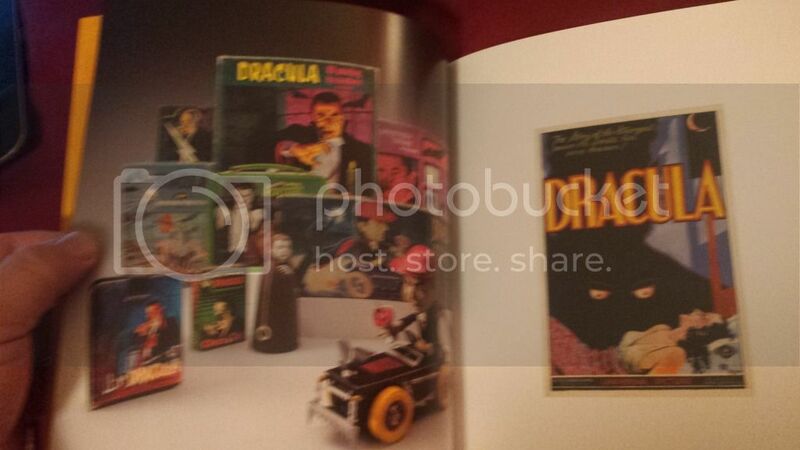 “The craziest collectors and dealers that I’ve ever met are movie poster collectors and dealers. It’s like these dealers get gold fever. They find a poster that’s worth five figures, and all of a sudden, they act like they’ve found a bonanza. Well, they have found a bonanza, but it’s weird. I’ve seen people change once they’ve gotten a certain poster. I know some collectors are on their second or third mortgage because they need to raise income to buy more posters. I know people who are so ruthless and so cutthroat about movie posters, I bet you they would sell their own mother to get certain posters. “I just think, ‘Wow, I’ve finally found a group of people who are just as nuts as I am,’” he continues. 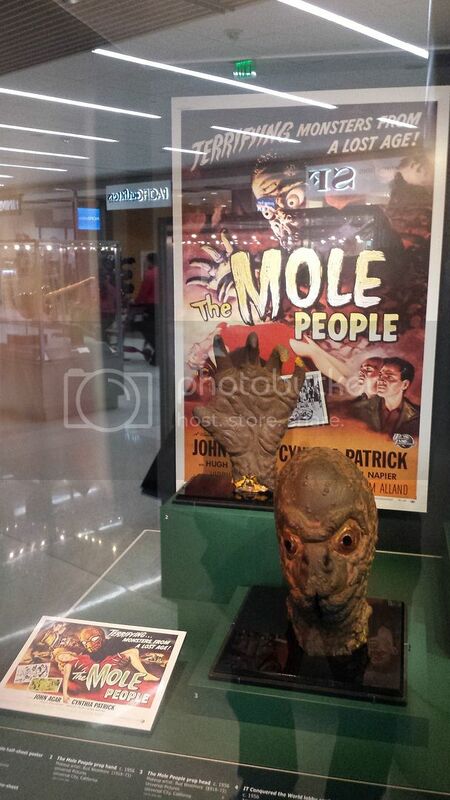 “I completely fit in with the whole movie-poster collectors mania. I want the same great posters as everyone else. And as a result of that, I can’t really talk to these guys, so I need someone like my friend, who’s a little bit more diplomatic, to be an intermediary for me. He can negotiate all the temperament, dysfunction, and passion that comes along with these movie posters.” End of Quote. I wonder if Mr. Hammett, among others who may have similar views, are members or guests here. Anyway, thanks for sharing this, H.
And here's a guy who collects in the upper stratosphere of the Universal horror genre. Where money and the want for a possible one known copy can get intense, Im sure! Well as a non-movie collector I'd like to say that I find you all terribly affable but quite quite mad. The lust for 'Star Wars' is I find quite extraordinary. And as for all the gore/horror stuff. What's all that about? Utterly baffled! We are not All gore and SW hounds, Nick. I agree, they're all nuts. as for Star Wars, that might need a whole separate thread... i think a number of points intersect around the series and that has helped elevate it on so many levels, for example, it taking place in a transition time (70s to 80s), cutting edge technology making a sci-fi film finally "believable", the trilogy aspect which wasn`t very common, and of course a story line that has all the key elements. Carrie Fisher never did it for me I'm afraid. ..... cutting edge technology making a sci-fi film finally "believable"
Rich, that tin man in The Day The Earth Stood Still looks a bit dated to me! I actually put quotations around "believable" to account for that context, I agree Rich that to the folks at the time thought WoTW was very believable. It is relative for sure. Having said that, SW was in a league of its own, there are a lot of articles about how Lucas and his team changed the special effects industry. Its not entirely computer-generated to the point where it blends actors and CGI seamlessly (like films today) but I think it absolutely still holds its own. And the thing is, in the first SW (Episode 4, A New Hope), there are no CG FX (unless you are looking at the the later RR, where Lucas went in and "revisited" the flicker). Later on, Yoda was CGI, when he flew around the room, light saber in hand. Even Jaba was a CG creation, in the later films. The original series, for what they did and had to work with, were ground-breaking, in so many ways. Bravo to that!! Producers aren't taking chances because the big money is in established characters and sequels. I'm actually drawing a blank right now trying to think of a really popular action/sci-fi movie of the past few years that wasn't a sequel or filled with established characters from earlier incarnations, comics, or books. Doing this also provides more security that an upcoming film will do well because everyone went to see the first one, so they'll most likely make money on the next one. Granted, my theory isn't foolproof. I don't know anyone who went to see John Carter of Mars, despite the fact that the character has been around for several decades. That could put me on a marketing tangent, so I'm gonna stop there. I'm still collecting interviews to run on our website and in the weekly e-newsletter, if you are interested. "Am I collecting this stuff...or is this stuff collecting me?" 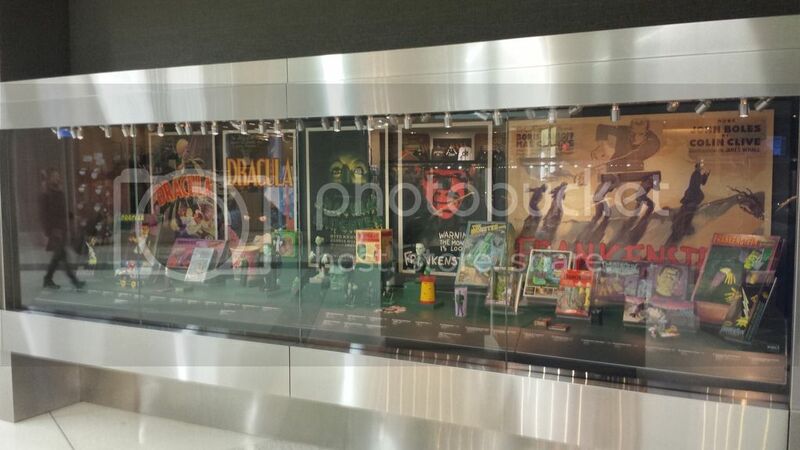 ...I found out about the exhibit at the SFO Museum (the "museum" is integrated in/around the airport in public areas on either side of the security checkpoints). While I've heard of Metalica, i had never heard of Kirk Hammett--until Jeff's post (I only saw this threat for the first time TODAY!). The exhibit ends Dec. 6 (or around there) and I'm actually IN the Bay Area, so i contacted a curator and begged and pleaded to get into the exhibit. This morning I made the trip from the East Bay to the airport, met up with the curator and--after a lengthy hassle with the security people (I did not have a boarding pass, because I was not flying in or out of the airport. i was just there visiting)---the curator got me IN to see it (I still had to go through the x-ray machine, send my shoes, belt, pocketfuls of crap, etc. through security though). The curator (Belinda Li---FABULOUS!!!) handed me a very nicely done program/catalog (Look for a picture on Amanda's thread) and a fold out brochure (which unfolds to become a small poster). The exhibit area wasn't very large, but large enough. I'll include some photos below. 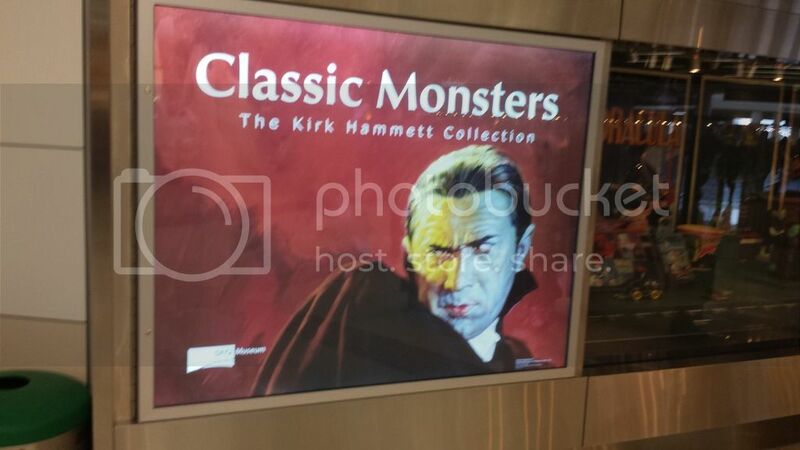 I was most anxious to see some of his rare authentic monster movie posters...but as i looked at them, it was apparent (to me--but probably not to the passersby who stopped to gaze) that they were only PRINTS of his posters (the giveaway was their size...they were all too small. They wouldn't have otherwise fit in the display cases). However the art was still gorgeous to look at. But there were more than posters on display. 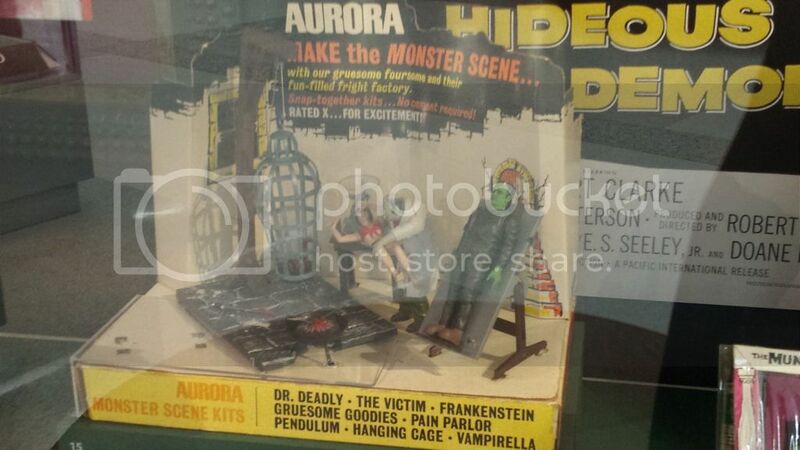 There were these amazing monster toys (loved the Aurora torture chamber playset. Ha!) 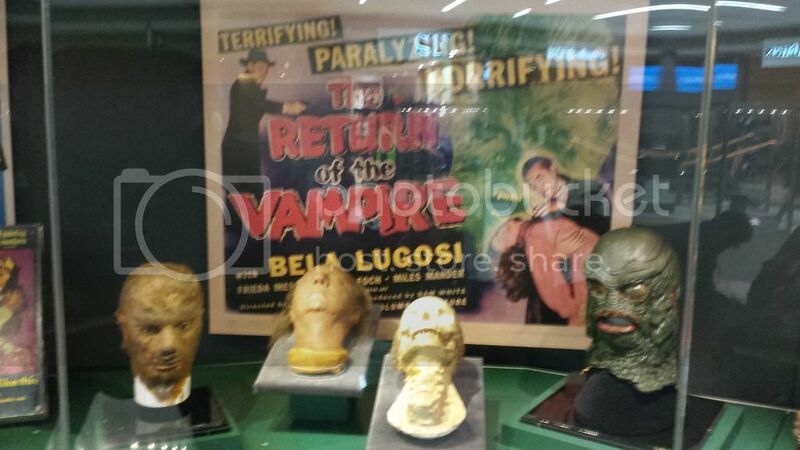 and incredible one-of-a-kind actual props from movies. 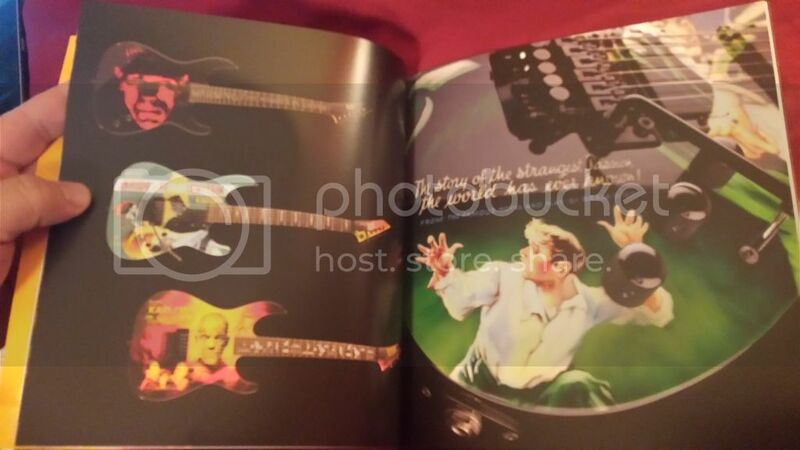 There was even a collection of his customized horror guitars. It was really cool to get to see. Let me introduce myself: http://www.allposterforum.com/index.php/topic,9291.0.html View my collection thread starting at entry 1356 (if you DARE!!! ): http://www.allposterforum.com/index.php/topic,9480.1350.html See what you missed here: https://www.blogger.com/blogger.g?blogID=5730339618306790065#allposts/src=sidebar CHEERS! 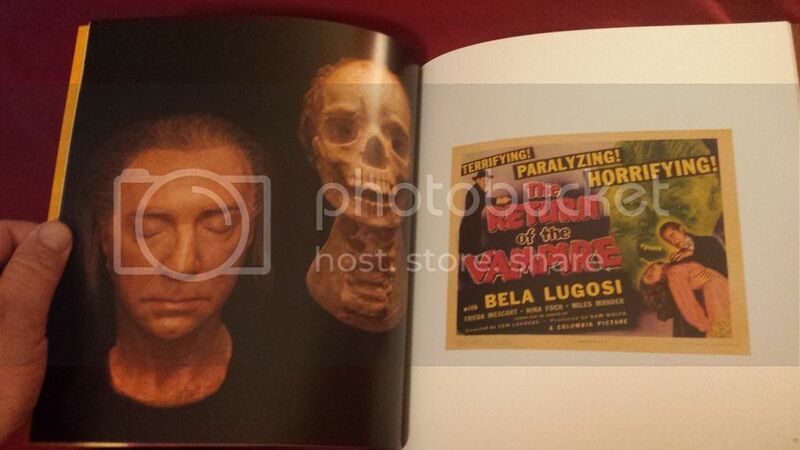 Does the booklet you got say they are under-size reproduction prints and not the real deal? 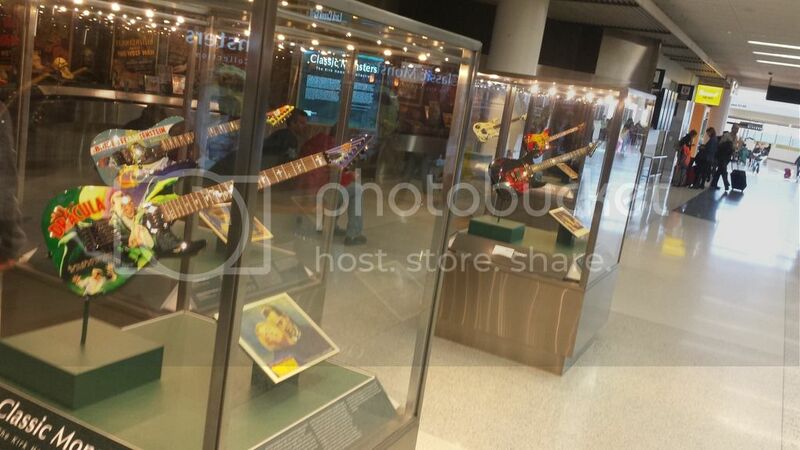 From your pics, even the actual props, (reading the descriptive cards, and them talking about the makeup artist, etc) let alone his guitars, are all genuine. Why would the posters be reprints? Any idea? Nope, no where in the nicely produced catalog/program (44 pages--I'll post some pictures for you in a bit) do I see anything about the posters being smaller sized prints. At first i took them to be real one sheets, but a friend with me marveled at their condition. I was going to say they were probably on linen and restored...and then i really looked at them. They were too perfect...and too small. And then I noticed the 3 sheet that was smaller than the one sheet. Yep---copies! 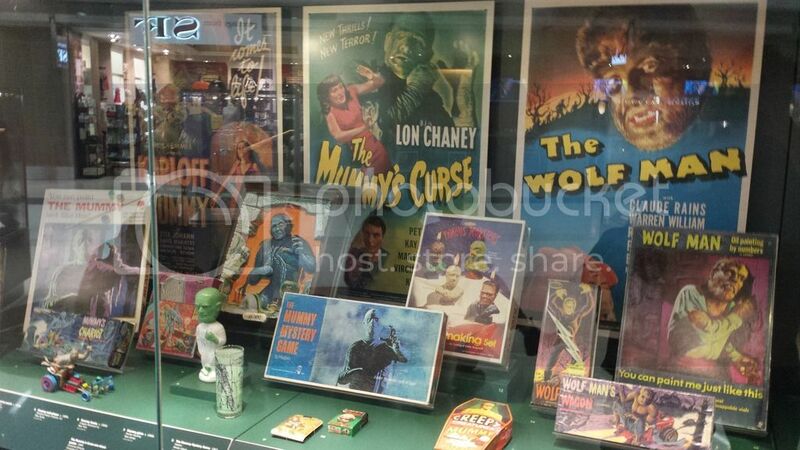 I believe they were under glass simply because of all of the cool toys set up in front of the posters. The toys were real. The props were real. The guitars were real. 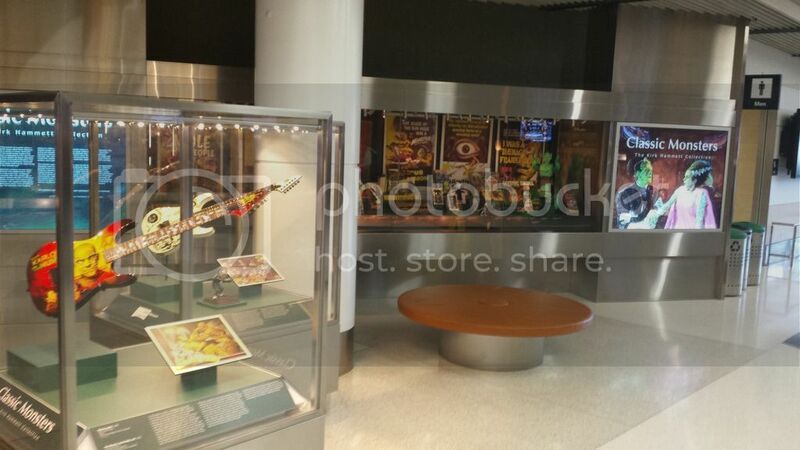 The posters obviously would not fit in the space and were prints. Prints or not, it was still nice to see the art on them. I had never seen the one DRACULA poster (with the eyes in the mass of darkness) before. 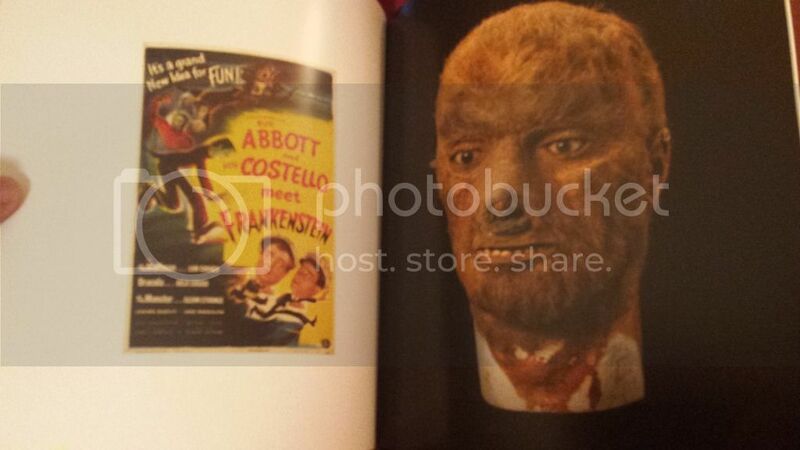 Okay--here's the program/catalog next to the foldout brochure. These were NOT generally available. I was given both by the curator. Wow thanks for sharing, nice to see you sweet talkin your way into that! 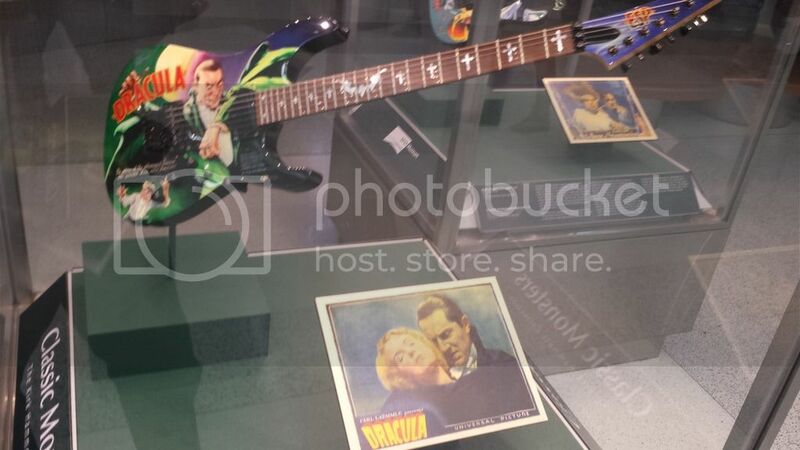 I gather Hammett's posters are probably mostly framed so it would have been too much of a pain to have the real ones there. Heck maybe the ones on the wall at home are also prints with the real ones buried somewhere safe! That horizontal 3 sh on the right bearing the coffin is just ridiculous.